The North American Retail Hardware Association’s efforts in encouraging its partners to support The Fuller Center for Housing’s Sandy recovery efforts have already paid off in donations of materials that have helped rebuilding efforts get up and running quickly in Atlantic City, N.J.
And while financial donations are the best way to support The Fuller Center’s rebuilding efforts, in-kind gifts of materials and tools also are important — especially as the Fuller Center Disaster ReBuilders focus on helping LaPlace, La., residents recover from Hurricane Isaac and The Fuller Center for Housing in the New Jersey Pines focuses on helping residents of Atlantic City, N.J., impacted by Hurricane Sandy. On both fronts, the biggest issue is repairing water damage. 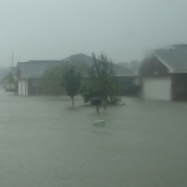 In both areas, houses were flooded with up to 4 feet of water; and in both areas, mold is growing quickly and presenting a danger to residents. Bart Tucker of the Disaster ReBuilders believes there are several hundred homes in LaPlace that can qualify for Fuller Center assistance and a couple hundred in Atlantic City that will fall into that category. Because the American public’s attention quickly turns to the most recent disaster, donations directed toward months-old disasters tend to dry up quickly. So donations of materials are particularly important for The Fuller Center’s long-term recovery efforts — which are ongoing in such places as tornado-ravaged Joplin, Mo., earthquake-struck Haiti and even places impacted by Hurricane Katrina seven years ago. And The Fuller Center will still be in Atlantic City and LaPlace long after public attention has waned. 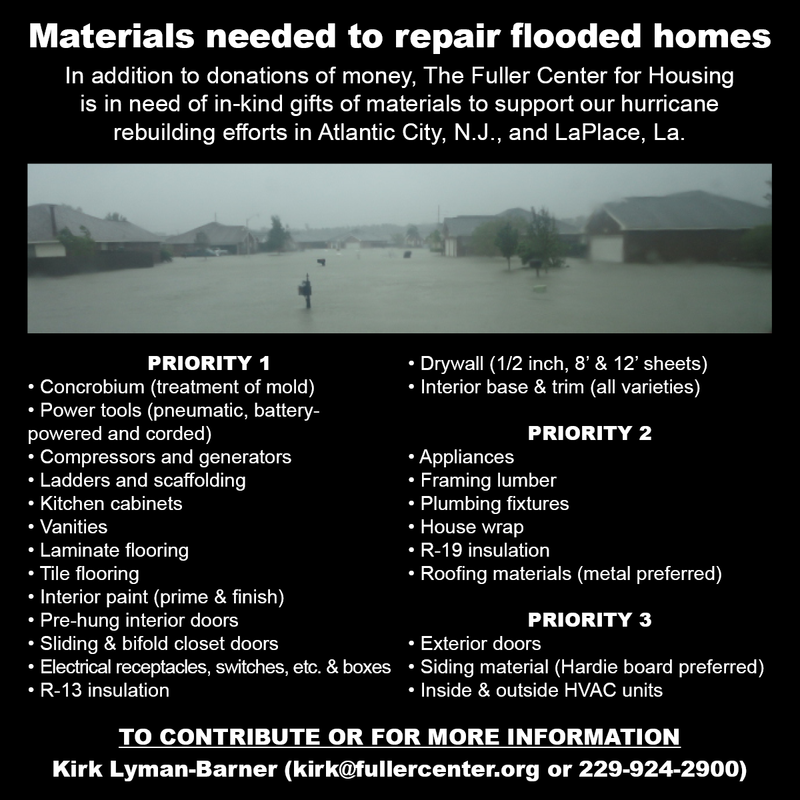 For more information about donating materials to help repair flood-damaged homes, contact Lyman-Barner at 229-924-2900 or kirk@fullercenter.org. Click here to financially support The Fuller Center’s efforts to help people recover from disasters — today, yesterday and tomorrow.